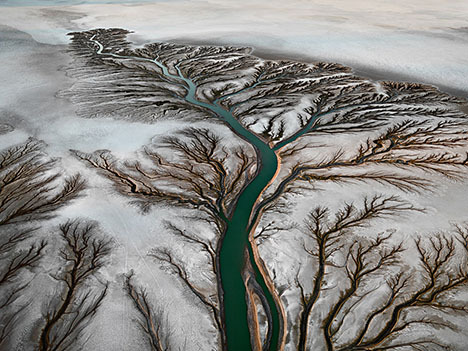 WATER: "While trying to accommodate the growing needs of an expanding, and very thirsty civilization, we are reshaping the Earth in colossal ways. In this new and powerful role over the planet, we are also capable of engineering our own demise. We have to learn to think more long-term about the consequences of what we are doing, while we are doing it..."
OIL: "...The car that I drove cross-country began to represent not only freedom, but also something much more conflicted. I began to think about oil itself: as both the source of energy that makes everything possible..."
MINES: In Burtynsky's images, it is the insatiable human appetite for the world's raw materials that is of primary interest. The tools of manufacturing are sometimes included, but they often function simply as a measure of the immense scale of the scene before us. QUARRIES: "...I remember looking at buildings made of stone, and thinking, there has to be an interesting landscape somewhere out there because these stones had to have been taken out of the quarry one block at a time..."
CHINA: "...mass consumerism and the resulting degradation of our environment intrinsic to the process of making things to keep us happy and fulfilled frightens me. I no longer see my world as delineated by countries..."
HOMESTEADS: From the beginning of his career, Burtynsky was attuned to the delicate balance that exists between humans and the environment We can see this clearly in a series of photographs he called "Homesteads..."